Top Tips for Medicating Dogs. 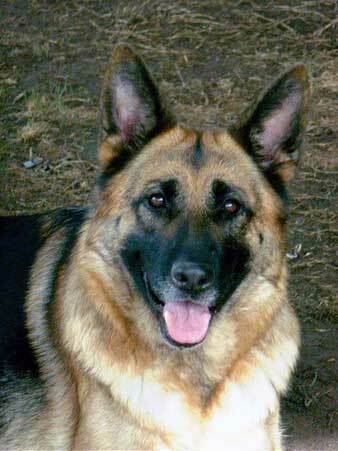 German shepherds have some of the same type of health issues as we humans do. On top of that, giving medicine to dogs or puppies when you need to isn’t always an easy thing to do. Most canine medications aren’t user friendly either, but there are some tricks you can use to try to medicate you dog when needed. Of course, it all depends on what form the medications are in and the actual temperament of your dog - and whether or not your dog is an easy "medicine taker". The easiest form, when dealing with dogs or puppies, is when the medication can be given with their food. Just mix it in the feeding dish and it is done - sometimes. Personally, I've had a few dogs that wouldn’t take medicine that way. They didn’t want anything in their food except food. 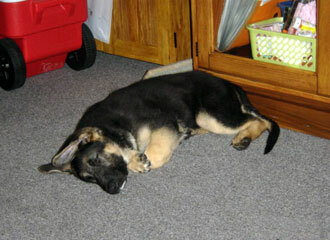 German Shepherd puppies can often be given their liquid medicine from a dropper. Just slide the dropper between their teeth and cheek and slowly give the medicine. Care has to be taken to make sure you don't choke the animal by giving the medicine too quickly. Tips for medicating dogs are very similar as long as the dog will stay still. Stabbing a dropper into a dogs gums won't make the dog willing to take liquid medicines in the future. If you are going to be giving your pet liquid medicines, ask the veterinarian if it comes with a dropper and be sure to get one. Pills often come in two different forms. The easiest one is often meat flavored and the dog just chews it up. But most pills shouldn't be chewed and you have to find another way to get the dog to take them. Top tips for medicating dogs when giving pills is to hide them in food. Some accepted foods for this are cheese, bread and meat. There are also pocket shaped treats that you can buy to actually hide the pills in. If you are going to medicate a dog this way, you need to ask the veterinarian which types of foods can be used with each medicine since not all human foods are dog friendly. Personally, my dogs prefer peanut butter, which can be messy but works every time. Some people even put peanut butter on a small piece of bread, wrap the bread around the pill (so that it is covered in peanut butter) and give it to their dog. Typically, I just use creamy peanut butter by itself - I'll put a heaping spoonful on a plate, or sometimes just on the spoon, and then stick the pill inside. The dogs just lap up the peanut butter, pill and all. This has always worked for me. If this doesn't work for you, and you have a calm dog, you can slide the pill between cheek and gum and slowly push it back behind the teeth. The dogs swallow reflex will usually help get the pill swallowed. I do not recommend trying to push the pill down the dogs throat if you don't know what you're doing. This can result in you getting bitten and in the dog being not willing to take medicine at all in the future. It can also cause scratches on the dogs throat which could become infected. Giving your dog medicine is supposed to make the dog feel better however fighting to get the dog to take medicine doesn't help the dog or you. So, to make your life, and that of your German shepherd puppies or dog, less stressful take the time to look for the easy tricks to get the job done. Sometimes it can be just as easy as using your dogs favorite food treat. Top tips for medicating dogs can be helpful in your life.